Stagecoach bus and rail employees from across the UK are to play a key role in supporting the 2012 London Olympic and Paralympic Games. Employees from Orkney in Scotland to Porth in Wales and Dover in England will play an important part in delivering public transport for the global sporting event this summer. More than 2,630 Stagecoach bus drivers and support staff will help provide transport for athletes and media throughout the Games after the transport operator was selected by the London Organising Committee for the Olympic Games (LOCOG) to deliver one of the largest transport contracts for the event. And Stagecoach Group’s rail franchises – South West Trains and East Midlands Trains – are among the UK rail operators providing additional services and extra capacity throughout the Olympic and Paralympic Games, as well as special tickets for Olympic Games spectators. With more than 14,700 athletes and 21,000 media representatives heading to London for the Olympic and Paralympic Games, Stagecoach’s UK Bus Project Team has been involved in detailed preparations with LOCOG for over a year. The transport group will provide around half of the 1000 buses needed to deliver the contract, with the remaining vehicles being provided by other bus and coach operators in the UK*. Stagecoach’s involvement will require varying levels of support from its regional bus companies across the UK. The vehicles provided by Stagecoach will be a mixture of brand new buses and existing vehicles from its fleet which are able to be released for Olympic duty while at the same time allowing the company to continue running all of its normal services for passengers across the country. Almost all of Stagecoach’s 100 depots across the UK will help provide resources for the Games – with staff heading to London from as far afield as Orkney. The table below provides a breakdown of the number of drivers attending the Games from each Stagecoach depot across the UK. Stagecoach Group Chief Executive Sir Brian Souter said: “The London 2012 Games are a once in a lifetime opportunity for our people to be involved in a global event on this scale. We are proud to be involved in the Games and look forward to helping make the event a success for spectators and athletes alike. We also send our best wishes to the British Olympic and Paralympic teams. The whole country is behind them and we all hope they are among the medals when the competition starts." Stagecoach will manage two bus depots throughout the Olympic and Paralympic Games – one at West Ham and one at Beckton. 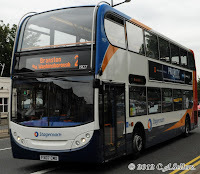 Stagecoach West Scotland Operations Director Rob Jones and Stagecoach East Midlands Operations Director Richard Kay have been appointed as depot General Managers, while Stagecoach Midlands Operations Director Elizabeth Esnouf was seconded to the role of Olympic Project Director in 2011. More than eight million people are expected to travel to the London 2012 Games venues and Stagecoach’s rail franchises will be instrumental in providing fast, frequent, reliable and affordable rail journeys into the capital city. Special Games train tickets are still available exclusively to Olympic and Paralympic spectators through a dedicated website,www.nationalrailgamestravel.co.uk. The 2012 Games Train Tickets are designed to allow more flexibility by enabling spectators to change the time they return should an event be unexpectedly rescheduled, or if they simply wish to stay longer. Stagecoach Group has a wealth of experience in providing transport to high profile, global events including the Ryder Cup, the British Grand Prix, the Wimbledon tennis championships and the 2010 Papal visit to Glasgow. Stagecoach; Allenby Coach Hire Ltd; Barnes Coaches; Baynes Travel; Bluebird Coaches (Weymouth) Ltd; Centaur Minicoaches; Country Lion (Northampton) Ltd; Coxy Travel Ltd; EYMS Group Ltd; Golden Boy Coaches Ltd; Guideissue Ltd t/a Bakers Coaches; Heyfordian Travel Ltd; Holmeswood Coaches Ltd; Impact Group Plc; Logans Executive Travel; London Borough Redbridge; Marshalls Coaches; Marshalls of Sutton on Trent Ltd; Matthews Coach Hire Ltd; Metroline Travel Ltd; National Express; Redline Buses; Regent Coaches; Safford Coaches Ltd; Simonds Coach & Travel Ltd; south Mimms Travel Ltd; Southgate and Finchley Coaches Ltd; Stephensons of Essex; Suffolk County Council Travel Services; Sullivan Buses; Thamesdown Transport Ltd; Thirlwell Coaches; Translink; Travel London Ltd (t/a Abellio London); W&H Motors Ltd; Wicksons.